20 µg plasmid DNA coding for ERAT4.01 N7Q YEMK, a ER targeted ATP probe with higher affinity for ATP (Kd~1-2 mM). ERAT4.01 N7Q YEMK is a CFP-YFP-FRET-based probe for imaging ATP within the endoplasmic reticulum of intact mammalian cells. 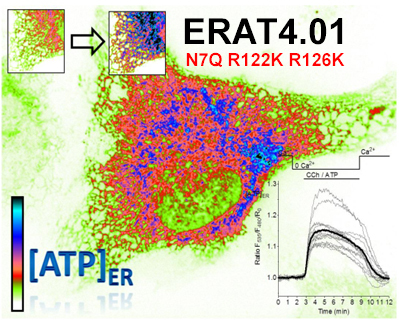 Notably, ERAT4.01 N7Q YEMK has a higher affinity for ATP (Kd~1-2mM) and lacks a putative glycosylation site. 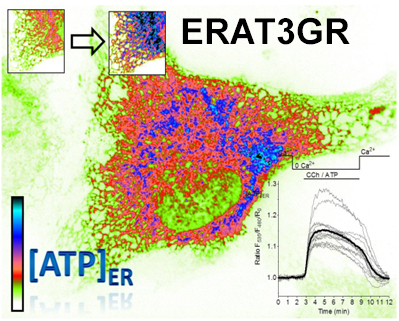 In order to express ERAT4.01 N7Q YEMK in cells of interest 20 µg purified, endotoxin-free plasmid DNA coding for ERAT4.01 N7Q YEMK is provided. The plasmid coding for ERAT4.01 N7Q YEMK represents a mammalian expression vector with a strong viral promotor. For plasmid amplification in E.coli. ampicillin should be used. Vector maps will be provided upon request. 1 – 1.5 µg DNA is required for cell transfection in a single well of a standard 6-well dish following standard transfection procedures. Usually cells express high amounts of ERAT4.01 N7Q YEMK 24 – 48 hours after cell transfection. Standart optical filters for CFP-YFP FRET imaging should be used.